Important Gold Rush map detailing the California Gold Region and showing Texas at its largest. Map of North America by J. Calvin Smith. 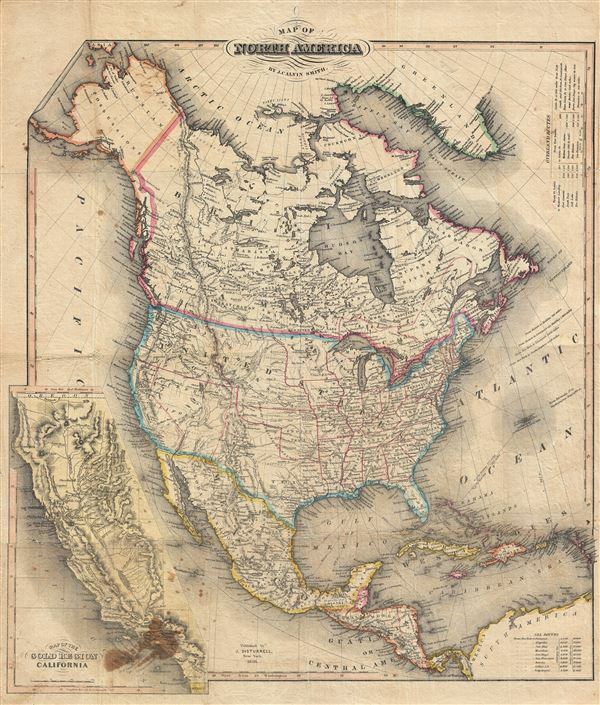 An extremely scarce 1850 map of North America by J. Calvin Smith. Published to capitalize on the mass westward migrations associated with the 1849 California Gold Rush, this map covers all of North American and Central America from Panama to the Arctic Circle, including Alaska and Canada. The focus of this map is clearly the United States, situated at center, and it is noteworthy for the ephemeral political configuration presented, particularly in the Trans-Mississippi, where Texas is represented at its fullest extent reaching nearly the 42nd parallel, a sprawling Nebraska Territory extends to the Canadian border, and a vast ill-defined territory is set between Texas and the proposed state of California. A large inset in the lower left quadrant details on the California Gold Region on a scale of 1:4,600,000. The year 1850 marked a period of enormous prosperity and optimism for the United States. The Mexican-American war had just ended and the nation found itself in possession of vast new territories with seemingly unlimited potential. The discovery of gold at Sutter's Mill, California must have seemed a confirmation of national hopes and dreams. A mass westward migration commenced across largely uncharted territory. Cartographers like Mitchell, Smith, and Disturnell were quick to recognize and supply up-to-date maps of the nation showing various emigrant routes with marginal accuracy. The present map illustrates several overland routes, some of which are detailed in a table in the upper right quadrant. The Mormon Settlement at Great Salt Lake, what is today Salt Lake City, founded three years earlier in 1847 by Brigham Young, is also noted. This is also one of the few maps to depict Texas in its most ephemeral from, embracing vast swaths of territory including parts of modern day New Mexico, Oklahoma, Kansas, Colorado, and Wyoming. This configuration appears only on the 1849 and 1850 editions of this map. On September 9 of the same year Disturnell published this map, the Compromise of 1850 reduced Texas by about 1/3rd setting the state's current borders. Maps showing the pre-Compromise borders are exceptionally scarce and highly desirable. This map first appeared in 1843, when Smith issued it as an inset on his gigantic wall map (published by Sherman and Smith) of North America. Intending to capitalize on the California Gold Rush transcontinental migrations, the North America inset was updated with a large sub-map of the California Gold Region and independently issued as a pocket map by John Disturnell in 1849. This is the second edition, issued in 1850, and described by Wheat as having 'hand colored lines showing political subdivisions.' Subsequent updated editions followed in 1851, 1852, 1853, 1854 and 1855 - all of which are exceedingly scarce. John Disturnell (1801-1877) was a New York book and map publisher operating gin the early to middle 19th century. Disturnell worked with various engravers and cartographers over the years including Calvin Smith, J. H. Young, and G. E. Sherman as well as the Ensign, Bridgeman and Fanning group. His primary focus seems to have been New York and vicinity, however, his most significant contribution to U.S. history came from the opposite side of the continent. When Nicholas P. Trist was sent to Mexico to negotiate the 1847 Treaty of Guadeloupe Hidalgo which defined the Mexican-American border at the end of the Mexican-American War, he carried with him Disturnell's Map of America. This map, among other inaccuracies, located El Paso a whopping 34 miles north and 100 miles east of its true location. Since Trist based the border treaty on mileages from El Paso, the obvious subsequent confusion lead to the conflicts that were to follow. The border problems between the United States and Mexico that resulted from this error were not resolved until 1963. Good. Even overall toning. Stain in lower left quadrant. Wear on original fold lines with slight loss at a couple of intersections. Professionally flattened and backed on archival tissue. Lacking boards. Rumsey 2770.000 (later edition). Wheat, C. I., Mapping of the Transmississippi West, 1540 – 1861, 692. Wheat, C. I., Maps of the California Gold Region, 232.